First edition, first print hardback of THE ART OF THE FELLOWSHIP OF THE RING (Lord of the Rings) by Gary Russell and published by HarperCollins Publishers in 2002. Full numberline 10 9 8 7 6 5 4 3 2 1. The book is in near fine condition (glossy pictorial boards with gold, white and green lettering to spine and front) with no significant wear. The dust jacket, which is not price clipped, is in very good condition with light creasing to the top and bottom of the front and back covers and spine. Internally, the pages are clean and tight and there are no tears and no inscriptions. 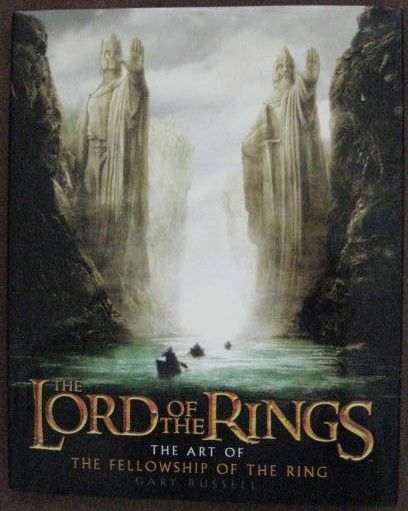 With complete and unrestricted access to artwork created over a five-year period, this authoritative and insightful book illustrates the creative development of The Fellowship of the Ring. This official publication contains 500 exclusive images, from the earliest pencil sketches and conceptual drawings to magnificent full-colour piantings that shaped the look of the film. All the principal locations, costumes, armoury and creatures are covered in stunning detail, including concepts, story-boards and images which did not make it into the final film. As well as a wealth of sketches, paintings and digital images, The Art of The Fellowship of the Ring contains photographs showing the realisation of the creative process and a number of stills from the film. Also includes text compiled from exclusive interviews with director Peter Jackson as well as special effects supervisors and designers.